California apricots are plump and delicious. 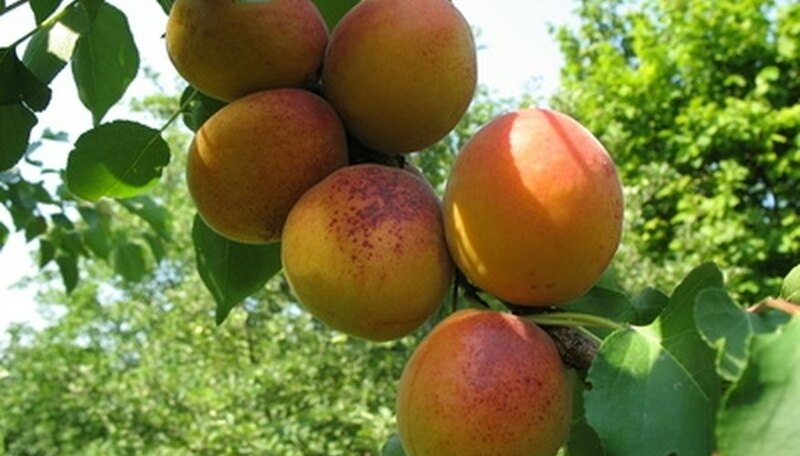 The size and quality of your apricots depend upon how well you care for your trees. Pruning your apricot trees correctly is one way to ensure that your trees produce large healthy apricots. Learn how to properly prune your California apricot trees so you too can harvest a great crop of fruit. Cut back your newly planted apricot tree to 30 inches tall. Cut off all the side shoots to one bud. Apply a coat of white latex paint to protect the tree from the sun. California's warm weather makes young apricot trees more susceptible to sunburn. Heavily prune your apricot tree while it is young. The tree should be kept fruitless for the first 3 years by cutting off the buds and shoots. This will increase the quality of the apricots in later years. Prune the tops of the vertical branches to expose more of the tree to the sun, encouraging proper tree development. Quality apricots are produced when the tree's branches are exposed to lots of sunlight. Cut off all branches bending down, and all branches growing down from a major scaffold limb. Take off all crossing branches. Also remove limbs, suckers and sprouts growing straight up, all dead or damaged wood, and old weak bud sprouts. Remove 20 percent of the previous years growth. Keep your apricot trees at a height that allows easy access to the fruit. If you need a ladder to pick your apricots, then your tree is too tall. Most fruit trees require pruning during dormant winter months, but apricot trees also benefit from summer pruning.